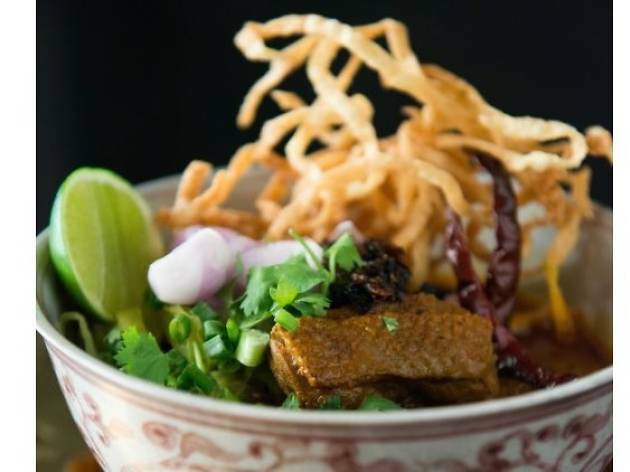 After acquainting Australians with Thai food, classically trained chef David Thompson picked up the cuisine’s first Michelin star at nahm London in 2001. Metropolitan in Bangkok came next, the restaurant that, in recent years, has been swooping Asia’s 50 Best Restaurant rankings – including the top spot on the 2014 list. Food-hunting Singaporeans are no stranger to Thompson, which might explain his first local outpost. Long Chim is an edgy-cool restaurant on a second-floor perch of MBS overlooking the frenzy of baccarat action. A bar serving intrepid Asian-flavoured cocktails and a row of comely banquettes lead the way into the main dining area. Three kitchens – they specialise in wok-frying noodles, throwing fire on main courses and wood-firing meats – corral an intimate gathering of tables, over which wafts the hot fragrance of a Thai fry-up and the rhythmic ‘pok pok’ of pestle hitting mortar. Thompson is seen criss-crossing the room many times during the course of our dinner, and because it was Songkran when we visited, the chefs – with Thompson as one of the masterminds – took turns drenching each other in water. 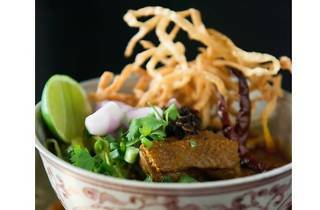 To charge Boulud or Puck prices for Thai food in Singapore would be suicide. Which is perhaps why Thompson keeps the street food, family-style dishes here between $20 to $30. The restaurant recommends three starters and four mains for a party of four. It’s hard not to over-order when starters ignite the palate from the get-go: we had the larb Chiang Mai ($10), which encases chopped beef, mint, Thai basil, and a gasp-for-air residual heat between lettuce leaves, as well as the smoky, tender skewers of cumin-and coriander-coated wagyu ($15). 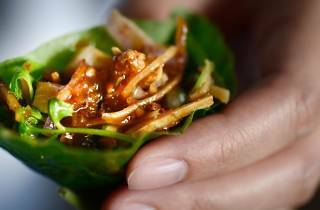 And even though we were identified on our incognito visit, we spotted the same approval around the dining room for the small betel-leaf pockets holding a salad of dried prawns, toasted coconut and Thai herb greens ($10) – they send the tongue a cascade of saltiness and sweet sauce, chased with the light bitterness from the betel. It’s hard to escape the same level of spice in mains like the minced pork-studded glass noodle salad ($16) and tom yum with chicken feet and wings ($18). The Chinese-style fried kailan stems with cubes of roast pork ($22) offer sweet relief, but pour on the sour, curry-soaked snakehead fish slices ($22) on your unlimited servings of rice and you’re in sweat city again. The bar seats pushed up against the different kitchens are suitable for solo dining from the noodle and rice sections of the menu. Thin egg noodles swim with dark chicken meat chunks ($22) in a fiery bowl of Chiang Mai-style red oil curry, but skip the holy basil minced beef ($25) – it’s serviceable, but can be enjoyed elsewhere for cheaper. In contrast, the desserts are unmemorable. The Thai staple of mango sticky rice ($10) is about as standard as it gets, as is the durian ice cream ($12). Cocktails like the mezcal-, peanut- and tamarind-mixed Tears of the Black Tiger ($18) taste savoury with a strong nutty overtone, while the Lumpinee ($18) is an uneasy accord between bourbon and fresh coconut water. For too long, MBS has been lacking a good food option for leaner pockets. But Long Chim, which translates from Thai to ‘come taste’, has now arrived to fill the gap. Though it’s still early days for the restaurant, with its vibrant cuisine and approachable prices, we can’t see it being easy to get a seat here in the near future. My mum and I quite liked the ambiance of the restaurant because it possessed an overall theme – the entrance, the bar lounge, the restaurant, and even the bathrooms were all coordinated with old school Thai wallpaper patterns and those iconic red plastic stools by the entrance made it seem more authentic. I liked how a whole section of the restaurant was in natural light because of the huge window – it made the atmosphere very open and welcoming. Chive Cakes – These were my favourite starter from the set lunch menu, as they resembled a Chinese chive dumpling, except this version was pan-fried. 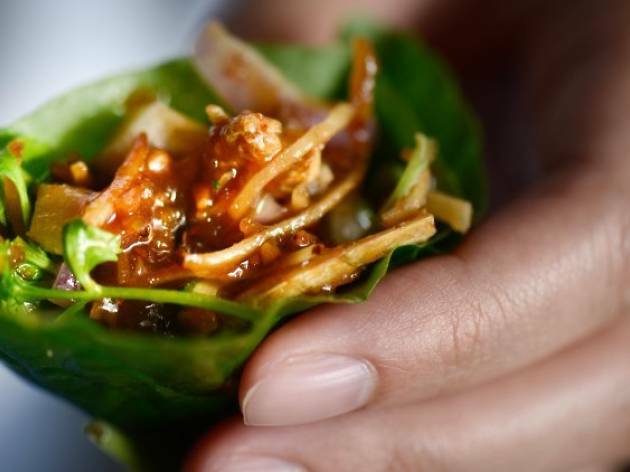 The dish was served with Kecap Manis (sweet and slightly thick soy sauce) and fresh herbs, which really helped to lift the flavours and to give it different layers of flavour. I liked the crunchy exterior skin, how full of chives they were, and that they were clearly freshly made, as they were still nice and warm. Grilled Eggplant Salad – We opted for this starter because it was a dish we’d not tried before in Thai cuisine and it seemed good. Much like most of the starters, this was served with loads of fresh herbs and chilies. It was also dressed with a sweet and sour sauce, which added much flavour. However, it was rather tangy! Cured Pork Fritters – This starter was pretty much just cured pork ribs and really tough ones at that! It was a disappointment because there wasn’t much meat on the ribs and it was rather salty. Fish Cakes – As an additional starter, we ordered this off the à la carte menu and it was lovely! The serving was much larger since it wasn’t part of the set lunch menu but a perfect amount to share between us three. The fish cakes came out warm and steaming, which we enjoyed and once again, garnished with loads of fresh ingredients and a tangy sauce that balanced well altogether. I liked how each fishcake was shaped slightly different so we could tell that they were handmade. Green Curry Chicken – This is one of my favourite traditional Thai dishes. I thought this was done really well and my favourite of the mains we ordered. It was quite spicy but enjoyable and filled with a range of ingredients – large and small green chilies, different types of eggplant, fresh herbs, and different cuts of chicken. This was served in a small bowl along with a bowl of steamed white rice. 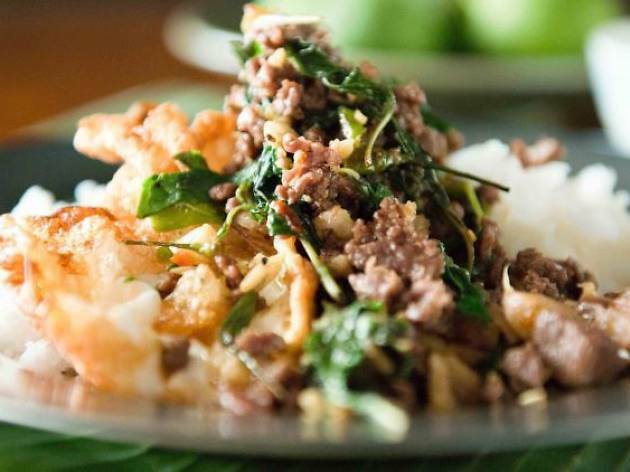 Basil Minced Beef – This came served on a single plate with steamed white rice and a fried egg. I liked that the beef was actually hand-chopped rather than minced,as it provided good texture and had a bit of a chew. We thought it didn’t have enough Thai basil and chili though, which gave it quite an ordinary taste. I’ve definitely had better tasting versions elsewhere. Chiang Mai Curry Noodles Soup – This was something we’d never tried before but it was nice because the curry gravy wasn’t very spicy and actually sweet. It came with loads of fresh ingredients and a generous amount of chicken with various cuts of chicken. I liked that the noodles used were egg noodles and flat like tagliatelle, as this helped to soak up and carry the gravy with each mouthful. The lunch set menu also comes with a drink (soft drink or coffee/tea), which you can have during or at the end of your meal. We opted to have it at the end, where my dad and I went for a Single Espresso and my mum went for an English Breakfast Tea. I really didn’t like the coffee because it was really sour, which I don’t enjoy. I drink my coffee black so I could really taste the acidity from these beans. During our meal, my dad and I went for a cocktail each since their Happy Hour runs daily from 12PM to 8PM. I went for the Melrose Fizz, which was nice but a little bit too sweet for my taste and I couldn’t taste any alcohol in it. It was served tall but had way too much foam in the glass – it came served with at least 40% of the glass being foam. My dad went for the 555, which was much nicer in my opinion. It was sweet but just enough and had a bit of tang from the green lime. Overall though, it was an enjoyable experience! The restaurant is really nice and its location is ideal, with the shopping mall directly connected to the MRT station. It wasn’t hard to find, as it’s located near the other celebrity chef restaurants above the casino. The service was good – our waiter was efficient and friendly and spoke well. There was a mix up with one of our starters but it was quickly fixed. It was nice to see a range of people at the restaurant – ranging from tables having business meetings, to casual diners such as ourselves. Definitely a multi-functional restaurant!